I was going to wait, and blog about Baku before anything else (it was the last stop on my trip and I swear I’ll get something up about it in the next couple of days – it was gorgeous), but then I finished Colour Affection on the weekend and I’m just too pleased to wait. So summery. So soft. So stripy. It really worked out so much better than I ever thought it would. As I mentioned, I started it just before I left because I hate casting on in public. I was only a few rows in, though, when I left for the airport. It was about 24 hours door-to-door on the way to Tbilisi, and although that included switching planes several times (and this lots of security lines), as well as, in theory, some sleeping, I still had lots of knitting time. By the time we got into Tbilisi, I was only a couple of rows shy of having the first two pattern sections finished. I finished the two-stripe section in Tbilisi and began the three-stripe short-rows in the car to Yerevan, but then, I got sick and couldn’t do anything but sit with my eyes closed and try to sleep. I got through a couple of pattern repeats in the short-rows before I realized I’d made a mistake. Each repeat is six bands of colour (12 rows), and I had knit 24 rows before I decided my short rows were really looking too short and something must be up. I went back to the pattern and, sure enough, I was one stitch short. For the next 12 rows I knit the way Veera intended, and then I added another stitch to my short rows and carried on that way for the rest of the section, which I finished on the flight from London to Halifax. (From Halifax to Toronto, 24-hours into travelling, I couldn’t knit any more and instead just slept. It was glorious.) It then took me a week to finish the two-inch border, which I attribute to the fact that a) those border rows are stupidly long, and b) I was back in my real life, and had other things to do. I bound off (using a 5 mm needle) on Saturday and then blocked it (I bought blocking wires for the occasion), and on Sunday, after going for a photo shoot/walk with L, I brought it to work, because my office is a fridge. I am quite pleased. I have to say, though, that I am surprised by how much I like it. I was really worried there for a while. The thing is, when you start with dark colours, you get used to how that palette looks. I like the grey, I like the green, and together, they played of each other nicely. 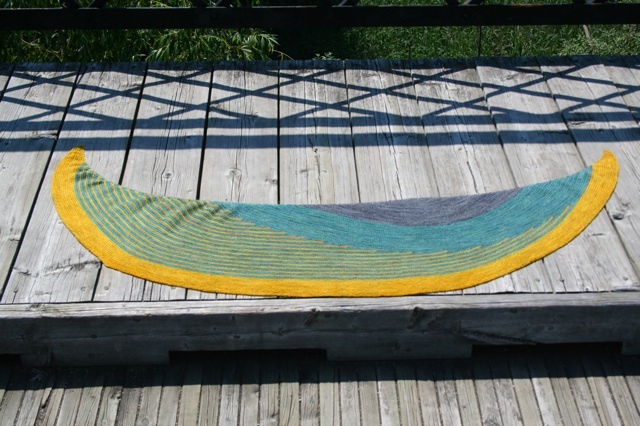 Then, when I got to the short rows and introduced the yellow, I felt like everything was suddenly off. Somehow, the nice greyish tones in the yellow disappeared, the subtly colour changes in the green were gone, and what I was left with was garish and, I thought, a little too tropical for my wardrobe. I was seriously afraid that after hours and hours and hours of knitting, I was never going to wear the thing. I couldn’t figure out how I’d gone so wrong – I mean, the colours had looked so nice all stacked up. Thank goodness I persevered. That two-inch border at the bottom saved it for me. The trouble is, when you’re knitting top-down, it’s hard to see how it will all come together, and for most of the knitting, the dominant colour seems to be the one you started with (in my case, grey). In the end, though, the short-row stripes are stronger than the other sections, and the band of colour along the bottom balances everything out. It was really hard to get the whole thing in, but here it is (can you imagine it with an extra 40-inches of length? It was be huge!). Modifications: I listed them above, and it’s ravelled here (if you’re into that sort of thing). 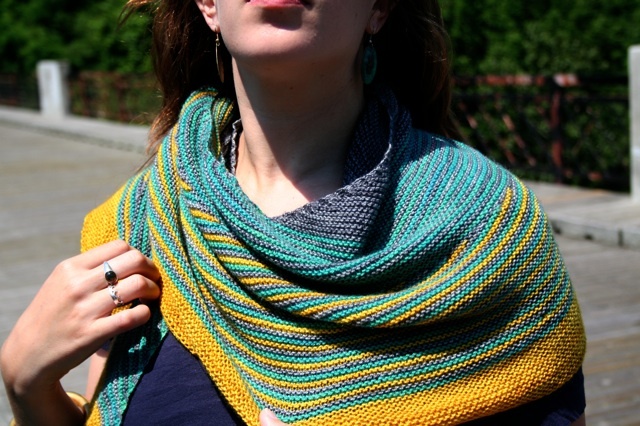 I’ll say also that I didn’t check my gauge because, well, how is a shawl not going to fit? Somehow, though, this means I’m about 40 inches shorter than I should be, according to the pattern (only 2 inches shallow, though). I have no idea how that’s possible, but there you go. I LOVE those colors together. I think it looks fantastic, and definitely not too tropical. Excellent choices. I found your site by accident. I love the colours you used. 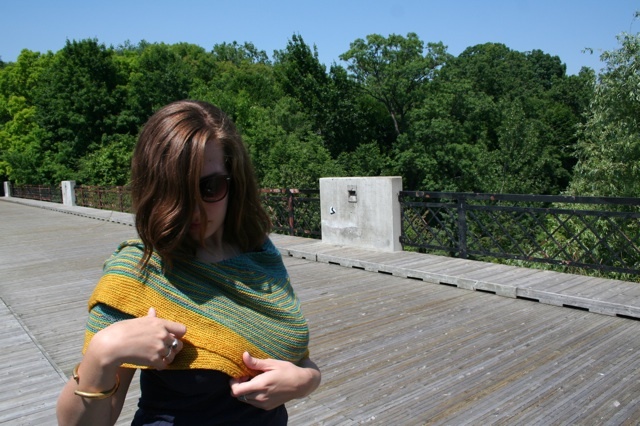 Your scarf/shawl is so attractive and shows off the pattern better than the samples on the pattern site.